The Fortus 3D Production Systems produces the most accurate and durable prototypes and parts using high-performance thermoplastics. And it offers the largest build size and maximum throughput. Only Fortus FDM technology offers advanced production grade thermoplastic materials and state-of-the-art hardware and software. By offering the most sophisticated technology, the largest build envelope and maximum throughput of any additive fabrication system, Fortus offers unprecedented versatility and capability. Parts produced with a Fortus 3D production system are 30-300% stronger than Stratasys parts produced with 3D printers, even when using the same materials. The advanced technology of Fortus makes the mechanical properties of the part the most accurate, stable, and durable. FDM Technology - Fused Deposition Modeling Technology. Fortus 3D Production Systems use Stratasys FDM (fused deposition modeling) technology and real engineering thermoplastics to build the most accurate, durable parts of any additive fabrication system. Directly from CAD files Fortus machines produce parts that are tough enough to be used for rapid prototyping concept models and functional prototypes and manufacturing tools, and end-use parts. CAD file to part in just three steps. All Stratasys FDM systems produce thermoplastic parts in just three steps, unlike some competitive additive fabrication processes that have up to 16 steps. Just load your file, machine produces part and remove the support material. Pre-Process - Load the part’s STL file (CAD data) in Insight file processing software. Manufacture Parts - System builds part in thermoplastic material one layer at a time on precise paths. Remove Supports - Remove temporary support structures in a hands-free soluble support tank. While competitors simulate thermoplastics using powders and resins, models and parts produced using FDM technology are produced from real thermoplastic materials and as a result are much more versatile. Parts can be used as prototypes, concept models, functional parts to test form and fit, manufacturing tools, and end-use production parts. Fortus Systems are based on Stratasys FDM – Fused Deposition Modeling – technology. Fortus 380mc is flexible, fast predictable and simple to operate. Manufacture Real Parts in a wide range of engineering thermoplastics. The Fortus 380mc allows you to manufacture real parts in-house with multiple production-grade thermoplastics, such as ABS-M30, ABS-M30i, ASA, ABS-ESD7, Polycarbonate and Nylon 12. The Fortus 380mc is a user configuration high performance workhorse, ideal for creating Real Parts for conceptual models, functional prototypes, manufacturing tools and end-use parts. The Fortus 380mc coupled with Insight front-end processing software, which let’s you quickly manufacture parts that match your technical, thermal, aesthetic and resolution needs. Real Parts with complex geometries, that are strong enough for functional and en-use. The Fortus 380mc has a build envelope (XYZ) 355 x 305 x 305mm with two (2) delivery material bays - one (1) Build Material Canister and one (1) Support Material Canister. FDM is the industry’s leading additive manufacturing technology and the only one that uses production grade thermoplastics. Enabling the most durable parts. Fortus 450mc is flexible, fast predictable and simple to operate. Manufacture Real Parts in a wide range of engineering thermoplastics. The Fortus 450mc allows you to manufacture real parts in-house with multiple production-grade thermoplastics, such as ABS-M30, ABS-M30i, ASA, ABS-ESD7, Polycarbonate, ULTEM 9085, ULTEM 1010 and Nylon 12. The Fortus 450mc is a user configuration high performance workhorse, ideal for creating Real Parts for conceptual models, functional prototypes, manufacturing tools and end-use parts. The Fortus 450mc coupled with Insight front-end processing software, which let’s you quickly manufacture parts that match your technical, thermal, aesthetic and resolution needs. Real Parts with complex geometries, that are strong enough for functional and en-use. The Fortus 450mc has a build envelope (XYZ) 406 x 355 x 406mm with four (4) delivery material bays - two (2) Build Material Canister and two (2) Support Material Canister with auto changeover between canisters. Designed and built for size, throughput. precision and repeatability. 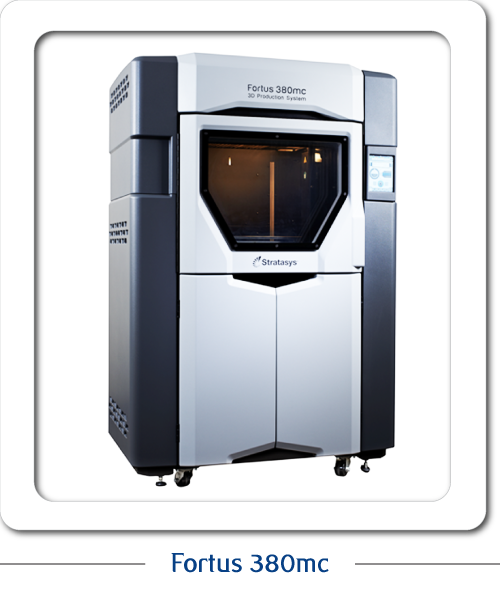 THE FORTUS 900MC WAS SPECIFICALLY DESIGNED FOR DIRECT DIGITAL MANUFACTURING. Not only has the build envelope dramatically increased in size over previous Fortus systems, there are significant differences in its mechanical, electromechanical and electrical systems. Specifically, the head gantry is driven by ball-screw technology resulting in more accurate parts with improvements in predictability and repeatability. Additionally, the control software has been modified to leverage the system’s hardware advancements. These features deliver greater throughput, accuracy, repeatability, and reliability. Like all Fortus 3D Production Systems, the Fortus 900mc uses stable thermoplastics that continue to outperform nearly all competing technologies in accuracy and repeatability. Proven FDM (Fused Deposition Modeling) technology manufactures Real PartsTM in production-grade thermoplastics that are ideal for conceptual modeling, functional prototyping, manufacturing tools, and end-use parts.